The Aegis Dynamics Reclaimer is HERE! A dedicated salvage and reclamation platform, the Reclaimer is the perfect ship for venturing into the ‘Verse in search of riches and secrets. Whether you’re churning debris fields for raw ore or searching for lost artifacts, the Reclaimer is built for utility. The life of a salvager can be tough, but with technology like the Reclaimer behind you it can be a profitable way to make your living among the stars. 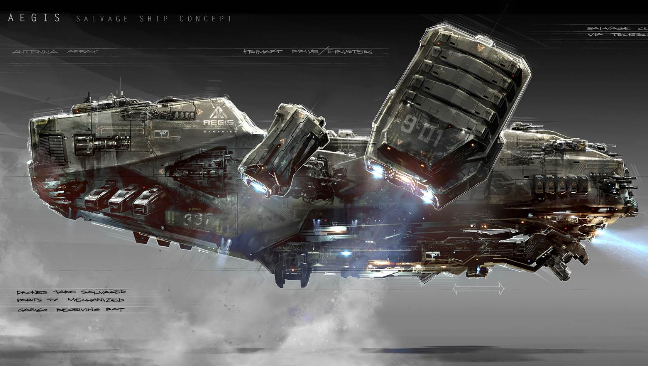 Aegis has built the perfect ship for those that want to write their own Star Citizen story. Equipped with a massive multi-tool arm, the Reclaimer can grab spaceborne salvage and then carry it aboard for processing. In addition to a large cargo hold, the hull is packed with reclamation equipment capable of processing and storing up to a Constellation worth of salvage! The Reclaimer’s turrets are multi-use hardpoints which can be mounted with defensive guns, missile batteries, additional tractor beams, floodlights, scanners or other salvage-specific options. The ship carries an array of Surveyor-class drones for seeking out valuable items in the distant depths. Additionally, it includes a manned cutter which may be deployed for EVA/recovery operations. We intend the game’s salvage mechanic to include a ‘search and recovery’ function in which players will exit their spacecraft in suits and maneuvering units to explore wreckage. Pocket spacecraft like the cutter will carry tools and supplies and transport recovered artifacts back aboard ship. All specifications are subject to change for game balancing. 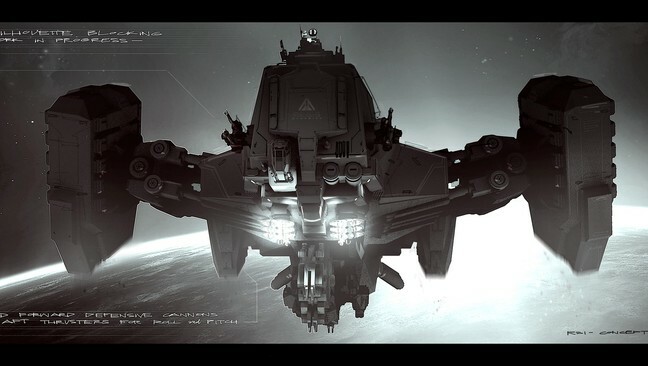 The Aegis Reclaimer is equipped with a reinforced cargo bay, unmanned surveyor probes, a set of front flood lights and advanced density scanners. It is also Jump-capable thanks to its standard Tarsus Marauder Jump Engine. Cargo Disclaimer: The Reclaimer is a big ship! Much of the internal volume is taken up with salvage machinery and storage for scrap metal. Nevertheless, it does have a large cargo hold which can be used for standard freight. We are currently in the process of taking proper in-engine measurements, and existing cargo numbers for older ships are likely to shift. Expect to see the cargo capacity of several ships increase as we move from ‘paper design’ to finding out what actually fits aboard the 3D models. 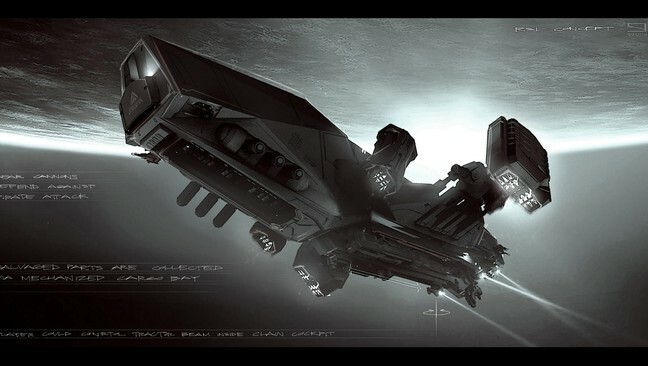 The intent is for the Banu Merchantman, Hull C and Starfarer to have more ‘pure cargo’ space than the Reclaimer, followed by the Caterpillar and then the Freelancer MAX. The Reclaimer is being offered for the first time as a limited concept sale. This means that the ship design meets our specifications, but it is not yet ready to display in your Hangar or to fight in Arena Commander. The sale includes Lifetime Insurance on the ship hull and a pair of decorative items for your Hangar. A future patch will add a Reclaimer poster and then once the in-game model is finished you will also be given an in-game Reclaimer ship model! In the future, the ship price will increase and the offer will not include Life Time Insurance or these extras. If you’d like to add one to your fleet, they’re available in the pledge store until Monday October 6th. You can also view a detail of the Reclaimer in the Holo Viewer in the Tech Overview of the ship page! 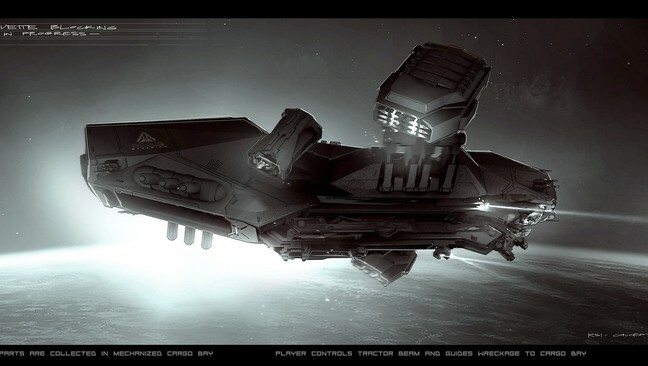 Remember: we are offering this pledge ship to help fund Star Citizen’s development. All of these ships will be available for in-game credits in the final universe, and they are not required to start the game. Additionally, all decorative ‘flare’ items will also be available to acquire in the finished game world. The goal is to make additional ships available that give players a different experience rather than a particular advantage when the persistent universe launches. Tagged Aegis, Citizen, Concept, Reclaimer, Sale, Unveiling, ‘Star.